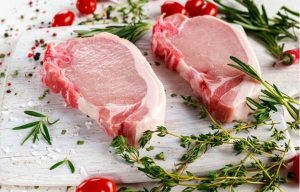 Season pork chops with Cajun Seasoning. In a Dutch oven, heat oil and brown pork chops. When chops are browned, remove hem from the pot. Add onion and bell pepper; and cook until golden brown. Add rice and saute for about 2-3 minutes. Add dry seasonings and water, and mix well. Place pork chops on top, and bring to a boil. Turn heat to low and cook until rice is done. Serves 4.